Learn about the people and country of Honduras. 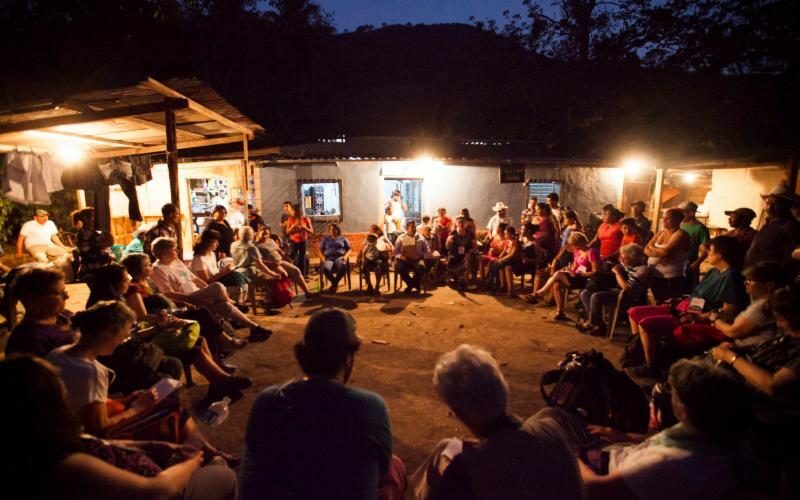 Learn what causes people to flee their home countries, and what local Honduran communities living with unimaginable danger are doing through belief in the power of nonviolent action. We are humbled to be in solidarity with them and to help raise the volume of their strong voices. In the first two days of our visit in San Pedro Sula, La Presa, and Bajo Aguan, we were witness to the multiple forms that violence can take. We heard about assassinations and death threats to human rights workers and water protectors; cultural violence against indigenous communities, women, and those who identify as LGBTQ; structural violence perpetrated by security forces against communities protecting their land and water; systemic violence of corruption, dehumanizing poverty, and deep economic injustice; gang violence and more. Read more about the risks and the organizing efforts at our blog. Radio Progreso itself regularly and at great risk broadcasts the stories of people struggling for justice and lives of dignity – countering the violence of the state, powerful companies and international interests. ERIC monitors human rights violations and accompanies threatened communities to prevent more killing. Organized communities in San Ysidro and Colonia Alemania are pursuing every legal route possible to stay on their land; one woman in San Ysidro simply sat with her children on the construction equipment waiting to level their houses as the whole community was threatened with expulsion. Women’s Forum and the Lenca women in Santa Barbara who are fighting for Mother Earth. Through art, symbols, stories, and political declarations they keep their struggles vibrant, remembering, as a source of inspiration and motivation, those who gave their lives in that struggle. Tejedores de Suenos (Dreamweavers) nurtures the self-esteem of women as they claim their basic right to dignity and respect, pushing back intimate as well as public violence. An active LGBTQ network has formed to make those who identify as LGBTQ more visible in Honduran society and thus less vulnerable to threats or assassination. The Alternatives to Violence program was introduced into the prisons in San Pedro Sula and prisoners themselves are trained to facilitate the program. Sisters of Mercy, School Sisters of Notre Dame and their co-workers love the children of violence back to life, helping to heal the traumas and push back the violence, including of gangs, that threaten to overwhelm. t action. We are humbled to be in solidarity with them and to help raise the volume of their strong voices.